If you are a fan of flavored hot chocolate, you will want to make this super easy Strawberry White Hot Chocolate. We make it with fresh strawberries and white chocolate chips. 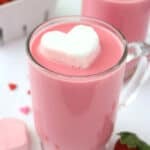 You can also add in a bit of red food coloring to make it a Pink Hot Chocolate that is perfect for a Valentine's Day treat. Hull strawberries and pulse in blender until pureed. Add sugar and pulse again to blend. Heat milk over low heat in a saucepan until warmed. Whisk in strawberry puree until blended and continue heating. Add white chocolate, stirring continuously until melted. If you want a bright pink color, add a few drops of red food coloring. Remove from heat, transfer to cups and garnish.